There’s an old saying that goes something like this: “… for want of a message, the battle was lost … for want of a …” And, so you might wonder, what the heck does this have to do with autos? The answer is easy: “for want of a headlight, the car might” have passed the Insurance Institute for Highway Safety (IIHS) crash testing with flying colors. More and more, cars and trucks are passing all of the IIHS testing, even the tricky small-front-overlap crash test, but are falling due to headlight issues. For whatever the reason, the auto industry has headlight standards that are still somewhere around 1950, while crash standards have now caught up with the 21st Century. Indeed, an IIHS study illustrated that the best-performing headlights of the many 2018 vehicles tested last year yielded only “Marginal” performance. Better performing headlights, ones that might have scored “Good” are often not available in lower-cost options. Headlights might be the only test that keeps a car or truck from earning an IIHS Top Safety Pick +. Look at Volkswagen’s 2019 Jetta. It breezed through the IIHS test suite with flying colors. But, the headlights kept it from passing all the way. According to thecarconnection, the Jetta lost ground on headlight performance, earning a “Marginal” rating for its projector-style headlights on the Jetta’s SEL trim. 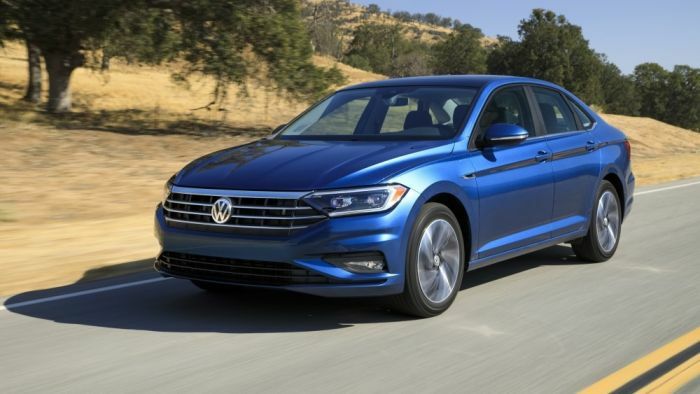 The 2019 Volkswagen Jetta walked away with impressive ratings from the IIHS' latest round of crash tests, but like dim headlights held the sedan back. That rating was the best of a poor batch as the insurance test group announced that the base S trim, the mid-range SE trim, and the sporty R-Line trim scored “Poor” ratings for their headlights. The headlights used by these models are LED reflector style lights. Some Things To Know About The VW Jetta. In the testing, the Jetta’s active safety technology earned “Superior” marks, while the Jetta scored “Good” ratings in the other categories. For example, in the tough frontal small-overlap test, the crash test dummies weren’t severely banged up in the test. The carconnection said that in this test, a vehicle hurtles at a barrier at 40 mph with only the driver’s side taking the hit. The test is meant to mimic a frontal impact where the car goes over the center line during the crash. Here's A Review Look At The Volkswagen Jetta. It is possible that the future may hold better news on the headlight front. NHTSA last year asked for new standards that would allow more modern and brighter headlights last year. There has been no decision yet. However, it is possible that automakers will, in future, will be able to set up something called matrix systems that automatically switch on high beams at various times, while other parts remain dim. For example, on seeing pedestrians or oncoming traffic, the lights may be turned so they won’t be blinded.